Different building types require specific types of mailbox design to meet their correspondence requirements. USPS delivered mail requires mail centers that meet federal regulatory codes that set standards for mail and parcel delivery. Interoffice or interdepartmental mail can be transferred through a variety of box types, including specialized letter boxes and parcel boxes. Mail centers for outdoor sidewalk areas, downstairs wall areas, and exterior walls are all available through XPB Locker Supply. One building type that needs a very unique mail center that takes up as little room as possible is the typical retail strip centers. These small multi-tenant buildings often lack any central interior hallway or exterior wall with sufficient space of vertical or horizontal mailbox designs. Resultantly, most of these small retail centers rely upon pedestal mounted CBUs, which stands for central box unit. These mailbox clusters offer each retail business its own personal inbox and feature a shared outbound mailbox and parcel box. 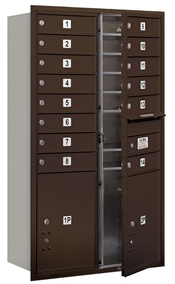 Additional parcel handling can be handled by outdoor parcel lockers that also mount on pedestals. It bears special attention for us to not the CBUs are also popular choices for single office buildings for law firms, CPA firms, and even very small office parks. Another important building type we work to accommodate is the commercial mail receiving center. CMRCs evolved out of public need to rent a mail box that could do more than the standard P.O. Box. CMRCs are now in almost every city in the nation and provide full-service mail and parcel deliveries for businesses, churches, and individuals. These businesses require mailbox designs that meet with full USPS regulatory compliance. They also typically need one or more specialty products that accommodate various types of large mail or package delivery. Still another type of building with unique mail delivery needs is the school building. Both public schools and universities have correspondence needs that reach far beyond USPS mail delivery. In addition to federally compliant mail centers, public schools need letter boxes for interdepartmental and administrative mail delivery between teachers and administrative staff. Universities likewise require mail drops for hard copy delivery between staff, various departments, and university headquarters. Parcel lockers are also standard for inter-departmental mail. USPS mail delivery can be handled through internal vertical or horizontal mailbox designs customized to university staff communication needs. This brings us to the many building types we find in today’s business world. There are industrial facilities, shipping facilities, and a broad spectrum of office building types. With the exception of very small office parks and single-tenant buildings, most businesses prefer an internal mail center of some sort. USPS regulations require public mail delivery be conducted only on the first floor of the building. USPS mailbox designs for commercial facilities include horizontal mail boxes, larger vertical mail boxes, and free standing USPS compliant mail centers ideal for lobby access. Interdepartmental mail needs can be accommodated with a number of specialty letter and parcel boxes and custom vertical mail boxes made for company mail between departments spread across multiple floors. This article was published on Wednesday 05 December, 2012.